Back in the late 19th and early 20th centuries as food began to be more and more mass produced and shipped long distances, instead of locally grown and sold fresh, it was basically the Wild West in regards to food production and there were no real official regulations on what you could add to food, or even that if you labeled something chicken, that it had to contain any chicken at all. And as there were also no rules about reporting any ingredients, businesses pretty much did whatever they pleased. To give you an idea of the kind of stuff the food and drug industries were cramming into things, secretly adding morphine to children’s cough syrup was a thing and, more pertinent to the subject at hand today, commonly used preservatives back then included borax, formaldehyde, sulfuric acid, and copper sulfate, just to name a few. It also wasn’t uncommon to use lead for coloring candy or to do things like grind up various organs and scraps from animals and sell it as chicken meat; grind up white rocks and clay to fill out flour; and use sawdust, charcoal and ground up charred animal bones to fill out coffee grounds. As an example of how widespread selling a product as one thing when it was actually something else was, in one experiment conducted by our hero of the hour, Dr. Harvey Wiley, his team found that 9 out of the 10 maple syrup brands sold in Indiana did not actually include any maple syrup in their supposedly pure maple syrup product. By the turn of the century, the state of the food industry had become a major cause for concern in terms of public health, but nobody was bothering to do anything about. Enter Dr. Wiley and his Hygenic Table Trials. The experiments were designed to test the safety of various preservatives commonly used by the food industry at the time. Although they began in 1902, Dr. Wiley had been petitioning the government to conduct such experiments for a couple decades (reportedly from almost the moment he scored the gig of chief chemist at the Department of Agriculture in 1883), only to be rebuffed by his bosses when food industry lobbyists caught wind of what he was up to. Finally in 1902 though, Wiley was given $5,000 (about $143,000 today) and permission to do whatever was necessary to test the safety of various food preservatives. Permission in hand, he set about finding 12 volunteers for a series of experiments the media would come to dub “The Poison Squad Trials”. Of course, it helped that Wiley was also offering a bit of pay for the gig and providing free lodging and prepared meals for a minimum of six months, with the person otherwise being able to go about their regular lives at normal jobs and the like. Owing to the nature of the experiment, volunteers were expected to be in perfect health and during their time taking part were given the best medical care money could provide. In return, all the volunteers had to do was eat whatever Wiley put in front of them and agree not to sue him or the government if they suffered serious complications. The general method used to ensure safety and figure out if the doses in common product were bad was to start with ultra low doses and slowly ramp up over time until the subjects started having adverse effects, if any. As for the experiments themselves, they began by establishing a baseline for vitals on each subject over the course of weeks and then the fun began, starting with borax which was commonly used to preserve meat at the time. Initially the plan was to add the borax to the food, but Wiley quickly noticed that as the dosage ramped up volunteers started avoiding anything the borax was added to due to its strong, metallic taste. Thus, he simply began giving volunteers a capsule full of borax at the end of each meal instead. To keep track of any and all effects the borax had on the volunteers, their vital signs were carefully measured several times a day and they were forbidden from eating any outside food so as to not contaminate the findings. Each man’s poop and pee was also analysed extensively and every volunteer was given a medical satchel containing various vials and containers they were asked to do their business into during their day-to-day lives away from the house the experiment was taking place in. The effects of the borax were noticed within weeks, with volunteers complaining of everything from headaches to depression and symptoms getting more and more severe as time went on. That said, for the most part volunteers, who were occasionally rotated out when transitioning to a new substance to minimize the chances of long term health problems, remained in good spirits for the five years the experiments took place. Notable exceptions to this were a few months into the borax experiments where volunteers briefly went on strike due to the symptoms becoming severe, as well as during trials involving formaldehyde. At the time this was commonly used as a preservative in various dairy products, but caused such debilitating illness in volunteers almost right away that Wiley cut the experiment short out of concern for their safety. Other than this, the group that the media would come to dub The Poison Squad seemed to enjoy the experiments and some of the things tested didn’t have any apparent adverse effects, like sodium benzoate, making for a rather pleasant few months for that set of volunteers. 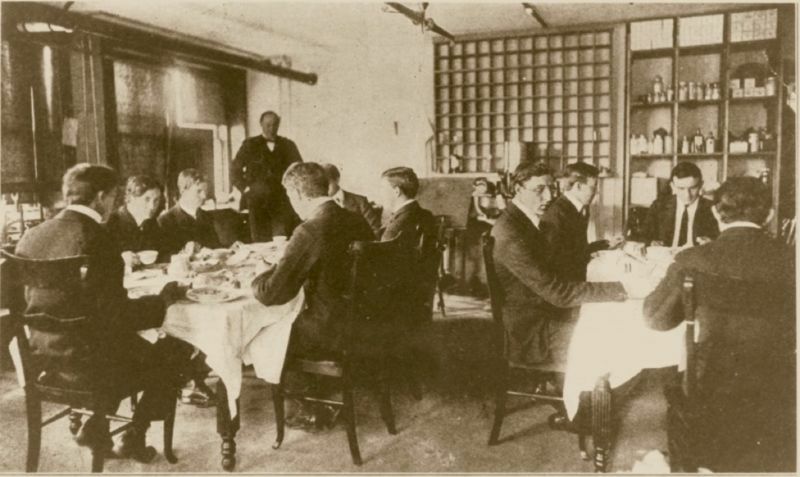 To add a touch of class to the proceedings, volunteers would dress in formal attire for evening meals, which, in addition to making these meals seem fancy, made for excellent publicity shots- shots which appeared in papers across the country alongside stories discussing the details of the experiments. These stories were immensely popular with the public, particularly when the substances were causing ill effects. The food industry, however, were less enthusiastic with the findings, which showed a lot of the then common preservatives were really bad for you. Thus, they used their collective might and political sway to suppress papers Wiley wrote on the experiments. These efforts were ultimately fruitless, however, as Wiley saw to it that his reports got leaked to the press anyway. When efforts to block the release of his findings failed, various industry insiders took to attacking Wiley’s credibility instead, as well as spouting rhetoric like claiming he was a “man who is doing all he can to destroy American business” and the like. In the end, the mob was roused thanks to the expirements, spearheaded by Women’s Clubs across the country who tirelessly lobbied for what would become the 1906 Pure Food and Drug Act, aptly nicknamed The Wiley Act. This Act, among other things, put in place rules requiring listing ingredients on labels so consumers could know, at least to some extent, what they were actually getting. The idea at this point was not so much to regulate the industries directly, but rather increase transparency so the consumers could decide whether they wanted to drink something that used formaldehyde as a preservative, for example. This Act, however, still left an amazing amount of wiggle room for various companies to exploit, culminating in the infamous Elixir Sulfanilamide Incident that condemned over 107 people (most of whom were children) to a slow and excruciating death thanks to the company involved adding a known highly poisonous compound to their product simply because it helped the main ingredient dissolve well in the mixture… Even when the death count started rolling in almost immediately, the company still only sent a telegram to doctors telling them to return the product, but didn’t bother telling them why or express the seriousness of the issue, so many ignored the telegram and continued to accidentally kill their patients. More on this shortly in the Bonus Fact below. Going back to the Poison Squad, the experiments formally ended in 1907 and although Wiley would eventually be credited as being instrumental in the first significant step towards making sure food consumed in the U.S. is reasonably safe, the contributions of the members of the Poison Squad have been largely overlooked. This is largely due to the fact that volunteers were anonymous, meaning in most cases their names aren’t known, though their badass moniker of “The Poison Squad” has certainly endured. Why are Kinder Eggs Banned in the United States? Why are Crazy People Called “Mad as a Hatter”? As noted, the Pure Food and Drug Act of 1906, still left an amazing amount of leeway to poison people to save a buck without any real consequences. This leads us to the Elixir Sulfanilamide Incident. In a nutshell, sulfanilamide is actually a perfectly safe antibiotic when administered properly, and was used, among other things, at the time to good effect at treating streptococcal infections. However, in an attempt to create a liquid version of the drug (it normally came in either powder or tablet form), the lead chemist at S.E. Massengill Company, Harold Cole Watkins, mixed it with diethylene glycol, commonly used today in antifreeze and as a solvent. At the time, it was known that diethylene glycol was highly poisonous to humans (most notably causing kidney failure), but Watkins did not know this when he decided to use it in the company’s elixir. He chose it owing to how well sulfanilamide dissolved in the substance and because diethylene glycol tastes slightly sweet, making it particularly good for getting children to take their medicine. In this case, even animal testing would not have been required to discover the substance was toxic. Watkins would have merely needed to do a surface level look into the compound, with several previous published studies noting diethylene glycol, even in relatively small doses, would cause kidney damage and potentially failure of said organ. But no such due-diligence research nor testing to determine the safety of such an elixir before putting it on the market was required at the time. Blissfully unaware that they were about to start selling a tasty tonic of death to their customers, S.E. Massengill sent out 633 shipments of the elixir in the autumn of 1937 to pharmacists across the nation. It didn’t take long for disturbing reports to begin coming in, including news of deaths trickling back to S.E. Massengill Co, resulting in them issuing telegrams requesting the elixir be sent back for a full refund, though not disclosing to pharmacists the seriousness of the issue if they ignored the telegram. The first time I ever had occasion to call in a doctor for [Joan] and she was given Elixir of Sulfanilamide. All that is left to us is the caring for her little grave. Even the memory of her is mixed with sorrow for we can see her little body tossing to and fro and hear that little voice screaming with pain and it seems as though it would drive me insane. … It is my plea that you will take steps to prevent such sales of drugs that will take little lives and leave such suffering behind and such a bleak outlook on the future as I have tonight. Needless to say, when all this came to light, the public were more than a little outraged, with S.E. Massengill’s somewhat brazen statement that his drug company wasn’t responsible for making sure their products weren’t simply poison at the recommended dose before selling them. To add to the tragedy, it appears Harold Watkins did not quite have the clear conscience of Dr. Massengill, with Watkins sadly committing suicide not long after it came to light that his error had resulted in the deaths of over 100 people. In the end, the Elixir Sulfanilamide Incident was the final straw, spurring an upgraded to the Pure Food and Drug Act of 1906 in the form of the 1938 Federal Food, Drug, and Cosmetic Act to hopefully prevent such a tragedy from occurring again. Among other things, the Act required that for the first time in US history, drug makers had to demonstrate to the FDA that drugs were reasonably safe before they could be marketed to the public, set standards for how different kinds of food should look and be packaged, and specified legal maximums for “certain poisonous substances” commonly added to food and drink at the time.